Marbled salamander is a wonderful looking species of the mole salamander family. It is a very interesting creature to observe. Read and find all about the species below, and see for yourself how interesting a creature this is. Its attractive looks and intriguing behavioral traits is sure to captivate the attention and interest. Length : Marbled salamanders are being recorded to have grown to the length of 4inches to 5inches. This length is small compared to the length of others in the salamander family. Head : These salamanders, like other salamanders, have a broad head. Their eyes, nose, and mouth are on the upper front side of their heads. Color : The marbled salamanders are black, dark grey, and deep purple in color. Their underneath is grey colored. Silver and white spots are on its back. Marbled salamanders are widely found in eastern United States of Americas. South of New England, to north of Florida, to western Illinois, and Texas, are the most widely populated domain of this species. 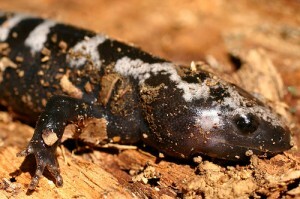 Marbled salamanders prefer woodlands, places where dirt accumulates, and gets wet and marshy lands. For breeding also they choose occasionally flooded areas. Apart from the breeding season the marbled salamanders are not much fond of entering water. Adult Marbled salamanders eat mostly insects, snails, slugs, centipedes, worms, etc. They also eat larvae and eggs of other amphibian species. The younger ones or the larvae diet on tiny aquatic plants and animals. Marbled salamanders are very interesting species in terms of behavior. They are extremely unsocial and lonely creatures. Apart from their breeding season they hardly come in contact with others of its species. 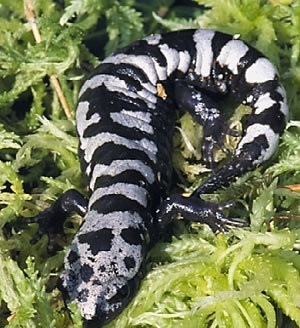 The male marbled salamanders arrive before the female ones at the prospective sites of breeding, during breeding season. They defend their habitats with aggression against other marbled salamanders. The marbled salamanders often get in to fights with others of their species during scarcity of food. 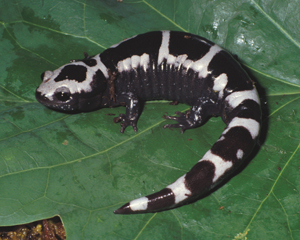 Breeding season of Marbled salamanders vary according to their distribution. They breed between September and October in northern part their distribution range, and the ones occupying southern part of their distribution range breeds between October and November. Marbled salamanders mate on land. The female salamanders lay 50eggs to 200 eggs, under a dug out depression in vegetation land, where there is plenty of water when it pours down. Mother salamanders coil up around their eggs, keeping them moist until it rains and the dug-out hole is filled with water. To hatch the larvae need lot of water in their surroundings. If they don’t get enough water in the winter rain then the larvae wait till spring to hatch. The larvae take about 3 months to 6 months to mature into salamanders, after hatching. Marbled salamanders have a long life comparatively. They live for about 8 years to 10 years on average. 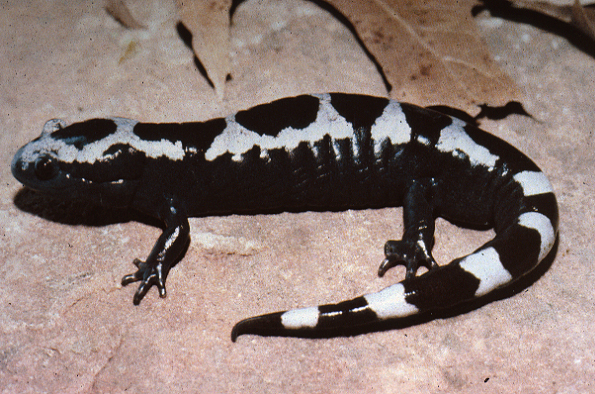 Almost all carnivorous and omnivorous species of animal kingdom are predators of marbled salamanders. Even other relatively bigger amphibians also prey on marbled salamanders. Marbled salamanders have no physiological adaptation features apart from the only one, their poisonous tails. While being preyed they can only run away from their predators. Or if they succeed in making their predators touch their tails, they can also get rid of the predators and even harm them. Marbled salamanders make excellent choice of pets, as they are completely hassle-free. They can be possessed and cherished playing with, only if the following few things are taken care of. Housing : Housing this species needs bit of care about securing the house. A glass aquarium, with moist surroundings created artificially would suite them the best. Some hide out places are very important for their housing, as they are to be kept in pair and need a burrow to mate. That burrow should be ideally water filled. Plant some live pot plants and climbers inside the pet-house. Provide some twigs, tree bark pieces, and wooden corks for them to climb and play. Temperature : The marbled salamanders should be provided with 65 degree to 75 degree F temperature during day and 60 degree F during night. They need humid temperature. The water kept in the shallow dish inside and the moist set up will maintain the humidity inside. They need about 70% of humidity. Diet : Feed the housed marbled salamanders some small insects. Feed them with two insects at the most each day. Provide some vitamin D3 and calcium supplement by dusting the powder on those insects. The supplement is required once a week. This species suffer no threat to their existence. According to the IUCN categorization this species is on the Least Concerned list, and have no threat to their survival in the near future also. This species of salamanders is very interesting to observe. Find out some very interesting facts about the marbled salamanders below. Marbled salamanders are very solitary beings. Their tails are poisonous and are the only adaptation features against predators. They grow very fast and reach adulthood in about 2 months. They are very defensive about their territory. Petting this species is smooth and they are fun to tame and play with. See the gorgeous pictures of this amazing species of salamanders below.